5-CD box (LP-size) with 44-page book, 146 tracks. Playing time approx. 386 mns. 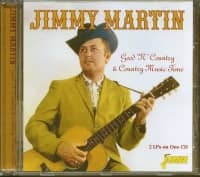 In 1949, Jimmy Martin left east Tennessee bound for Nashville. He joined Bill Monroe before striking out on his own to become one of the best loved figures in what he called Good Ol' Country Music. Here are his ultra-rare recordings for RCA (1954) including the classic '20/20 Vision', and complete recordings for Decca/MCA (1956 - 1974). 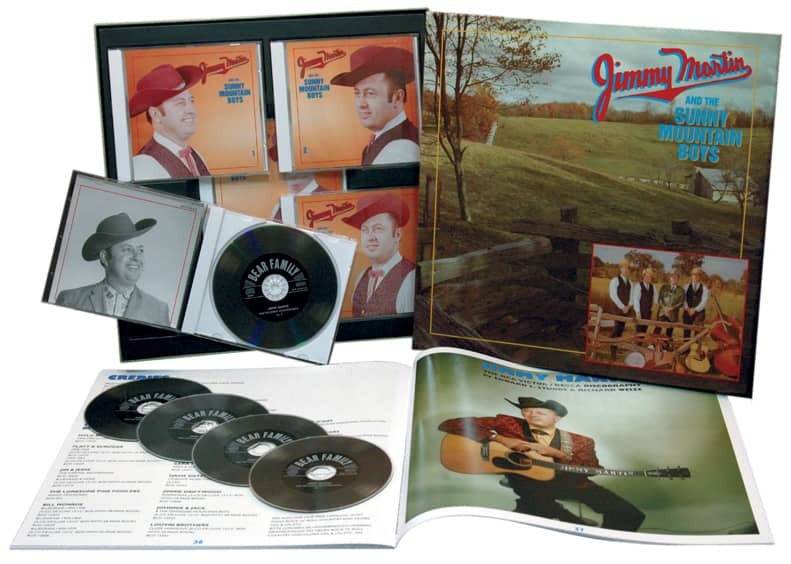 Jimmy's novelty hits, like Can't Quit Cigarettes, are here, as well as his truck driving hit, Widowmaker, but the emphasis is squarely on good ol' country music. Jimmy's interpretations of classics like Poor Ellen Smith, Shenandoah Waltz, In The Pines, Shackles And Chains, and Beautiful Brown Eyes aren't outclassed by anyone. Backing musicians include the Osbornes, J.D. Crowe, Chubby Wise, Benny Martin, and Bill Emerson. 01 Save It! Save It! Two major bluegrass careers got underway here. Jimmy Martin (born in Sneedville, Tennessee on August 10, 1927) first came to prominence as a member of Bill Monroe's Blue Grass Boys (he's on I'm Blue, I'm Lonesome on our 1950 volume) but fell out with Monroe in mid-1951. He met Bobby Osborne in Bluefield, West Virginia, and they recorded one session for King in Cincinnati later in '51. After Bobby went into the service, Martin began working with Bobby's 14 year-old brother, Sonny, in Middletown, Ohio. Monroe called, and they came to Nashville to play on his July '52 sessions. Monroe asked Martin to stay, and Martin persuaded Monroe to hire Sonny on banjo until Rudy Lyle got out of the Army. 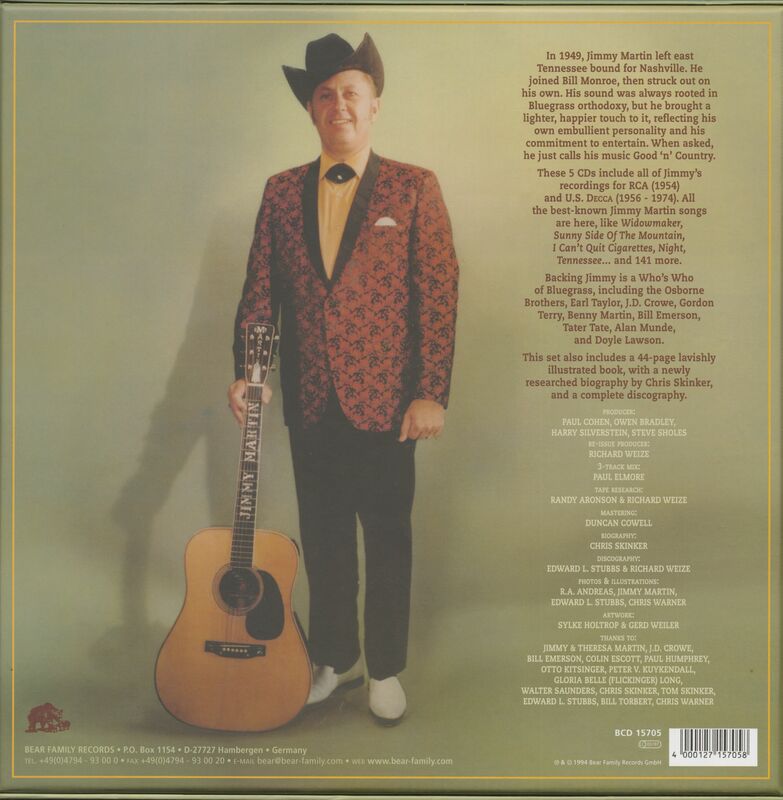 "While I was with Bill that second time," Martin told Chris Skinker, "I got to know Troy Martin who was [with Gene Autry's publishing company, Golden West Melodies]. Sometimes, I'd go down there and sing some of Troy's songs. Steve Sholes from RCA came by and heard me sing and asked me if I'd like to record for him." Monroe wasn't in favor of his sidemen making solo recordings, so Martin handed in his notice and headed back to Middletown. Meanwhile, Bobby Osborne had got out of the Army and joined his brother in Knoxville, Tennessee. Martin called them and they met in Detroit to work on WJR. Up in the chill Detroit autumn, they practised their three-part harmonies until they shimmered. It was time to get back with Steve Sholes and tell him that Jimmy Martin and the Osborne Brothers were ready. "We got to Nashville," Martin told Skinker. "I called Red Taylor who was one of the best fiddle players in bluegrass there ever was [Taylor had played on Bill Monroe's 'Uncle Pen']. And I called Cedric Rainwater who everybody knows is the best bass player that ever hit Nashville [Rainwater had worked with Hank Williams and Monroe]. And I called Troy Martin and got some songs. When we went into record we were really rehearsed. We each knew how loud to play to back the other one up. We knew when to hit it hard and hit it light. The man who cut the records didn't have much to do. We'd already mixed it for him." Troy Martin had worked for Peer Music until Peer had gotten wise to some of his practises. Gene Autry signed him up as the Nashville rep for his Golden West Melodies, and Martin acquired a song, Just Walking In The Rain, that had been a R&B hit for the Prisonaires on Sun Records. After Autry recorded it, Troy Martin and Columbia's Don Law got it to Johnnie Ray who made it into a worldwide smash. Martin also acquired 20/20 Vision for Autry, who'd recorded it in 1954. The song was written by a Nashville dee-jay, Joe Allison, better known for writing Live Fast, Love Hard, Die Young and Jim Reeves' He'll Have To Go. Allison's cowriter was a minor league Opry star Milton Estes. "The Osborne Brothers said we couldn't do that song," Martin told Jim Moss. "Said, 'It's not bluegrass. It's not our style.' I said, "It's gonna be our style when we get through with it.'" And it was. Although not a charted hit, 20/20 Vision sold well, but not well enough to keep Martin and the Osbornes together or on RCA. Within a year, the Orbornes had left Detroit for Wheeling, West Virginia (see our 1956 volume for the continuation of their story). Martin assembled a new group, and moved on the Louisiana Hayride in Shreveport. Troy Martin shunted Jimmy Martin onto Decca Records, where he remained for the next eighteen years. In 1964, he re-recorded 20/20 Vision. In the 1993 bluegrass documentary 'High Lonesome,' Martin explained how he approached 20/20 Vision, singing it first in Autry's style and then as bluegrass. It was, as he would be the first to say, an example of the transformative power of genius. 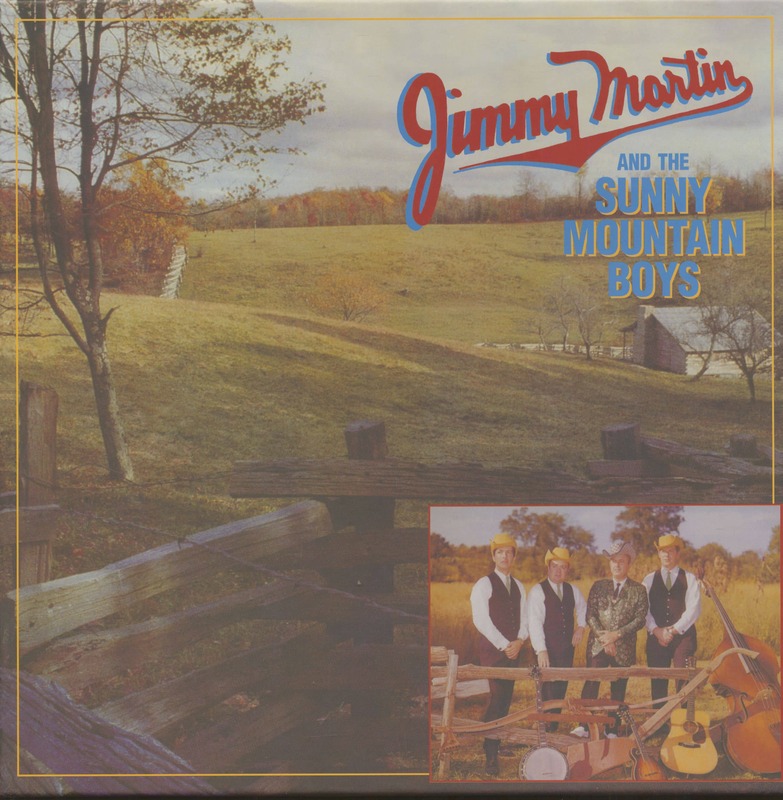 Customer evaluation for "& The Sunny Mountain Boys (5-CD)"